The present brick church stands on the site of the original building. It was started in 1857 and completed in 1858. There is no record the builder, or the cost. It is said that a African-American brick mason, Jim Veeney, laid the bricks which had been made in a nearby pit. Few changes have been made to the exterior of the building, which retains the simplicity of lines found in the 1858 structure. 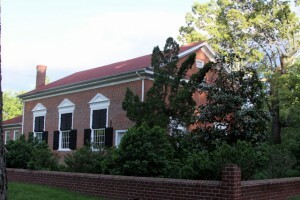 In 1927, the present Sunday School annex of brick and frame with five classrooms on the first floor and a social hall in the basement was added. This annex was dedicated to the memory of Dr. Eugene Pendleton at Country Church Day services in 1927. The contractor was Chestine T. Sprouse, a member of the church. Over the years, numerous interior changes have been made. In 1977-78 a general refurbishing of the interior improved the appearance. The old pews were refinished; brass chandeliers were installed in the sanctuary; and a handsome secretary desk, crafted by Willie Sprouse was dedicated to the memory of Ms. Anne P. Forrest, who had been a faithful member for life. Many other generous gifts have also been bestowed on the church. In 1989, the Thacker sisters contributed funds for the air conditioning system for the sanctuary in memory of their parents, Mr. and Mrs. John H. Thacker. The family of Lavert A. Woolfolk gave the handsome brass candlesticks in his memory; the Christian Women’s Fellowship (CWF) funded the redecoration of the Kings’ Daughters classroom. In 1993, Mrs. Nora T. Bennette gave the attractive burgundy cushions for the pews in memory of her late husband, James Bennette. Also in 1993, a memorial plaque was installed in the main sanctuary testifying to the generous endowment of the D. Everette Bumpass family. A large addition in 1999 provided additional sunday school rooms as well as a more spacious fellowship hall. Gilboa has a cemetery with perpetual care provided by volunteer donations. Land adjacent to the church was given by Miss Millie Gardner for the burying grounds. The first recorded burial was in 1905. I hope that you will be able to restore the church and not have to tear it down and build a new church. My great aunt, Julia Florine Mallory Tate is buried in the cemetery here along with her husband and son. Also, my cousin, Lydia Lorene Mallory Tate and her husband were members here. Dal – we definitely plan to restore it! Many thanks for your kind words. Thank goodness for a restoration. I had called Judge Harkrader and found out it was damaged. Have you in my prayers and thoughts. Glad it was not damaged so bad that it could not be repaired. Can you tell me if Aunt Julia’s stone was damaged? Not sure off the top of my head. A local funeral home has generously volunteered to repair the broken stones in the cemetery, so if her stone was damaged it will be repaired. Thanks again for the prayers and well wishes!